The consequences of environmental information for our modern information society and its active role in collecting, assessing, and using environmental information were highlighted at the recent CEGeoIC2013 Bogota conference in Colombia. This international and interdisciplinary conference was dedicated to scientific and technical methods of environmental information and communication. Special regard was given to the central role of geoinformation. 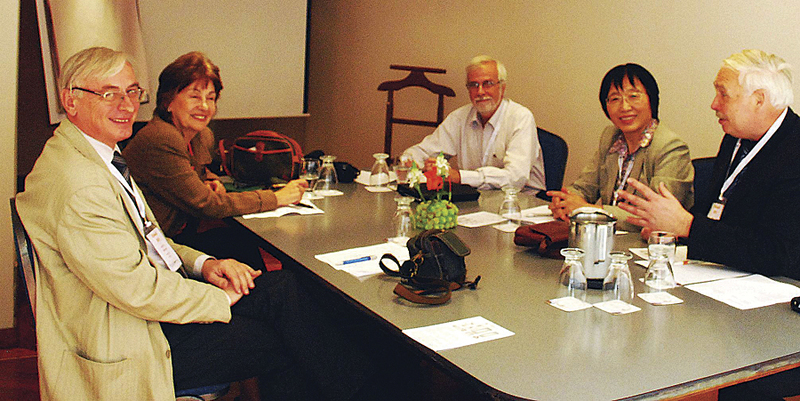 From left to right: Vladimir S. Tikunov, Lomonosov State University, Moscow (Russia); Margarita Marino de Botero, CEO, International Congress of Environmental Sciences, Bogota (Colombia); Paulo Márcio Leal de Menezes, vice president Int. Cartographic Association (ICA), Rio de Janeiro (Brazil); Chuang Liu, Institute of Geographical Sciences and Natural Resources Research, Chinese Academy of Sciences, Beijing (China); and Horst Kremers, CEGeoIC2013 conference director and chair CODATA-Germany, Berlin (Germany). Parallel to the English language international conference were three workshops in Spanish organized by Esri distributor Procálculo Prosis S.A., Bogota (the main sponsor of the conference), on the application of geoinformation in the broader domain of environmental practical applications. The panel discussion on risk showed that links to past events underline the need of developing an appropriate prevention strategy for investment and prevision of technical and organizational security measures. Furthermore, postdisaster costs must be better assessed and normalized to allow a more efficient strategy for reaching prevention goals; the importance of sharing knowledge and experience was identified as being crucial for developing countries. The ethical issues are part of this complex process and must not be forgotten. It was noted that digital public “environmental observatories” used as virtual public arenas and communication channels open a new, broad field of action, interaction, and social construction. Arenas supporting the collective definition and observation of environmental problems are urgently needed. Interaction of “agents” engaged in democratic activity may be contributing to such a public sphere. A comparative content analysis of available information, participation tools, and interaction showed how these aspects are expressed. A special postconference meeting of the organizers with the president and general secretary of the Colombian Academy of Physical and Natural Sciences gave the perspectives of broad and stimulating exchange between scientists, as well as mutual information and communication on strategically important aspects that arise from major international action fields. For more information about the CEGeoIC2013 Bogota conference and to order proceedings, visit CEGeoIC.net.